The White mice or pet mice are a domesticated form of the wild house mouse, of which there are a number of different subspecies. Today there are many different varieties of pet mice or fancy mice. 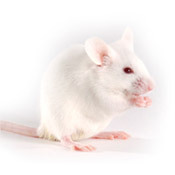 The most common domestic mice are the white albino ones which were (and still are) used in laboratories. 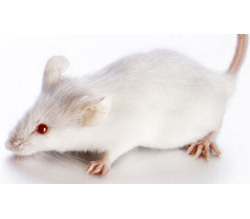 Various other mice strains have been developed in laboratories from inbreeding. These various strains will have individual characteristics such as being a more long lived mouse, or one that tends to develop more tumors, or needs a specialized diet, as well as other traits such as being more temperamental, more nippy, or more flighty. Mice are very sociable creatures and like to have company. One mouse can do fine as a pet, but they appreciate having friends of their own kind as well. Most mice get along fine with each other, but you should watch out putting males together (unless they grew up together), because they will tend to fight, especially if females are present. Usually females can be put together with no ill effects. Mice are great with children, but they should be kept away from the other pets of the house (dogs, cats, birds). They should also be kept away from other rodents such as rats, because rats are their natural predators. 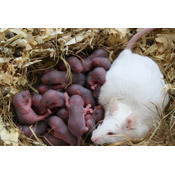 Female mice reach sexual maturity at about 6 weeks old, and males take a week or two longer. Females can have up to 15 litters a year, and can become pregnant within 24 hours after giving birth. So if you don't want more babies immediately after the first litter, it can be a good idea to remove the males. However, males can be kept with the females after the babies are born as they will not harm the young (and often actually help to babysit!). When baby mice are born they are deaf, naked, and blind. Within two weeks the babies will look just like their parents, just smaller. They may be weaned in approximately five to six weeks.